Turtleneck sweaters are one of my favorite parts of fall (as seen here and here). They are cozy - and simple, yet chic. These turtleneck sweaters are 30% off. Also, I am guest blogging over on The Blended Blog - be sure to stop by and say hello. I love that sweater in beige, so gorgeous!! I own this J. Crew sweater and I want to buy other colors now - it is so tempting. Thanks, Chelsea. I feel like even though I have a ton of sweaters, I need more and these may be added to that list! So cute! Leopard boots are my favorite too. Thanks, Amy Ann. Sweaters like this one have been in and out of my wardrobe for years, I need a few new ones! Thanks, Brooke. They have been around for years - and still classic. Leopard boots are the best! Thanks, Shaunacey. those leopard print shoes are very fun! I agree - you can't go wrong with leopard. Thanks, Kelsey. Moto 'Hayden' Ripped Boyfriend Jeans look so cool! I'd love to have a pair myself. I think a leopard bootie is quickly moving up my must have list for the fall and winter. Looks like a great cozy sweater for fall. Loving how you styled it! 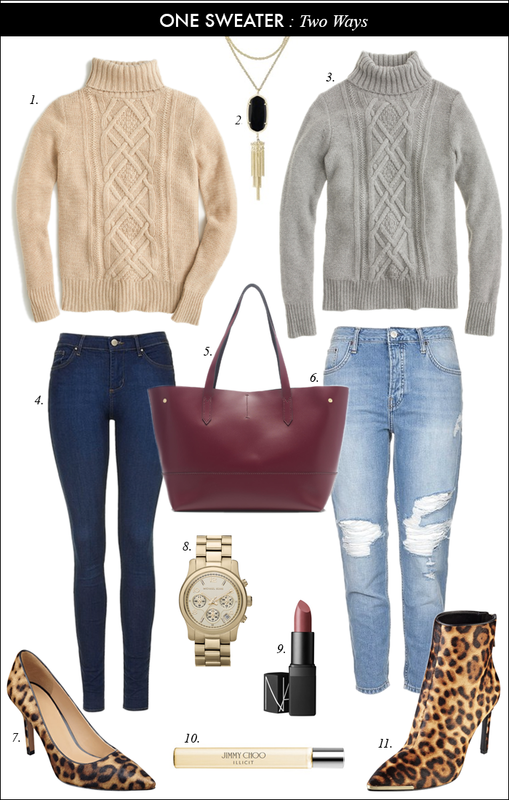 This is such a classic sweater and I really like both ways you've styled it here! Those leopard booties are amazing. Loving both outfits- so excited to work sweaters into the rotation again! love this idea, of how to wear something more than one way. diversity is the key!